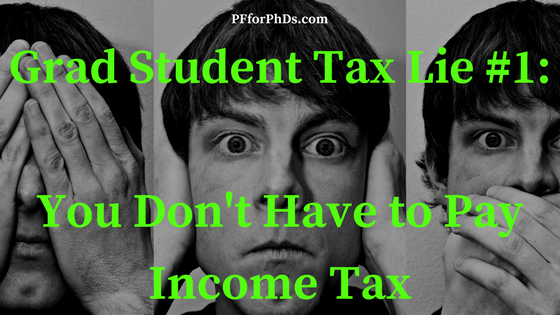 Grad Student Tax Lie #1: You don’t have to pay income tax. I once heard a tax preparer state, “You must start from the assumption that all of your income is taxable. The function of your tax return is to show that some of it isn’t.” This statement has stuck with me for its clarity and simplicity. Graduate student stipends used to not be taxable income. If your parent or another older person in your life received a grad student stipend prior to the Reagan administration, she didn’t have to pay tax on that. But if your tax preparer is still telling you that your stipend isn’t taxable, his information is about 30 years out of date. Likewise, scholarship income (like your tuition waiver and the money that pays your fees) isn’t taxable if it is used for qualified education expenses, but you very well might have scholarship income that isn’t balanced out by qualified education expenses. If you’re paid any money that you use for your living expenses (e.g., housing, food, health insurance), that is a big glaring warning sign that you have real income that will be subject to taxation. Anything you receive from your university above your qualified education expenses is potentially taxable, whether you receive official-looking tax forms or not. Your income may be so low that you don’t end up paying any tax, but you will still need to file a tax return. Also read tax lie #4 and tax lie #5 for more details on this topic! See the tax lies home page for a full list of tax lies that graduate students should not fall for. This post relates to income tax. Can you clarify on whether stipends are subject to FICA or self-employment taxes? Thanks! Sure! Grad student stipends are subject to neither FICA nor self-employment tax. Tax lie #2 addresses self-employment, and I can add the FICA ‘lie’ as #11. (Of course, they are closely related.) Thanks for the article idea!